Last Saturday, a sizable crowd of Parang enthusiasts gathered at Oâ€™Meara Road in Arima to witness twelve parang bands compete in the National Parang Associationâ€™s national Parang finals. Although the night was cold, which is common during the December month, the crowd was hot with excitement and anticipation for the bands to play sweet Parang music. Already people could be seen gearing up to dance and finding comfortable spaces to watch and listen to the bands. Scheduled to start at 8 pm, the proceedings got underway at around 9:30 with an address by Michael Lezama, the President of the National Parang Asssocation. Lezama told the audience that Parang is an artform that generates a spirit of brotherhood by its message of immense joy and peace. He emphasized that Parang celebrates the divine essence of Christmas and criticized the materialistic bent of society. He went on to explain that the pursuit of materialism is the cause of a lot of the ills that are seen today. He underscored that the purpose of the NPA is to elevate the artform and called on persons to support Parang with all their heart. He outlined that there is a hunger for World Beat music but persons outside of Trinidad hardly know about Parang. Mentioning that the NPA is now celebrating 35 years of existence, Lezama thanked the media for their support and said that Parang has a bright future once certain prerequisites are met. The Honourable Senator Joan Yuille Williams, Minister of Community Development, Culture and Gender Affairs, then came on stage to give her address. Speaking to an audience who were impatient for the Parang to start, she emphasized Governmentâ€™s support for Parang and spoke of the importance of culture in developing Trinidad and Tobago. She also thanked the NPA for its role at the recent Carifesta. As Richard Mendez began to give the vote of thanks audience members began to shout for the competition to start and began clapping to rush him to end. At 10 pm, as the first band began to set up on stage, the eager crowd rushed forward to occupy the space at the front of the stage. The crowd shouted their approval as the first band, Unidad Serenaders began their first selection. Sections of the audience erupted in graceful dancing and swaying to the sweet sounds of Parang while the atmosphere became hot and heavy with exhilaration. In keeping with the Christmas season, red seemed to be the popular choice of colour for many bands. Audience members were also dressed in and shirts, pants and dresses made with fancy cuts and irregular shapes and spicy colours which further added to the festive mood. Each Parang Band had to perform two type of songs, La Anunciacion and El Nacimiento. Technical difficulties with the sound system delayed certain bands and even caused Los Amigos Cantadores to have to do over one of their songs. Despite this, the enthusiastic audience lapped up the offerings of the 12 Parang bands. Members of the audience danced the night away to the lively rhythms of the Parang music. It was refreshing to see young persons performing within the Parang bands and also present in the audience, ensuring that participation and interest in Parang music is continued to upcoming generations. La Familia de Rio Claro closed off the competition to rousing applause from the appreciative audience. As the judges deliberated, Robert Munro, accompanied by two other musicians, kept the audience entertained. 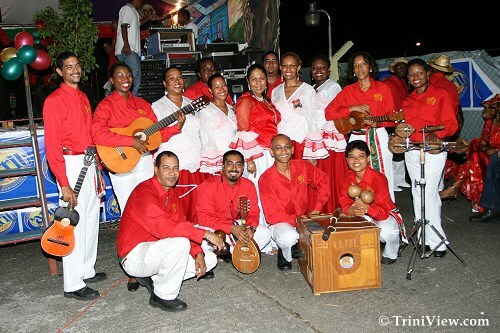 When the results were read out, Los Parranderos de UWI, one of the crowd favorites, emerged as the winner, with their lead singer Joanne Briggs copping the award for Best Female Vocalist. “Los Parranderos de UWI performed “La Virgen Santa” and “El Buen Posadero”. The St Augustine based band have won the competition after placing second eight consecutive times. Philip Salazar of Los Pastores was named Best Male Vocalist. Congrats to Los Parranderos de UWI – well deserved, long overdue.